Primal object at the arrival to Kyrgyzstan was research of the valley of river Dzanajdartaka and peak and ranges on both side of that valley. Depending on actual conditions participants wanted to ascend several peaks and descend from their summits on skis. 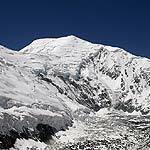 In advance, the main chosen tasks were Kyzylagin (6684 m) and Pik Korzenevskovo (6008 m), which are believed to be virgin according to known sources - not climbed neither skied.